We have all seen them, those beautiful brown and white striped feathery critters on the reef. But did you know they really only belong in the Indo-Pacific and not here in Florida? The Lionfish is an invasive species in the Atlantic and Caribbean oceans. Unfortunately, we are not really sure how they got here. There are rumors of a hurricane that destroyed a resort that had these fish in their aquarium sending them into the sea and other rumors of people releasing Lionfish from their home aquariums. Whatever the story, it is clear that Lionfish has invaded and reports have come back saying they have been seen as far north as Rhode Island and as deep as 1000ft! Why are Lionfish bad for our Florida reefs? They can consume a wide range of fish and invertebrates and yet they have no significant predators. Lionfish multiply quickly, they can release up to 30,000 eggs per spawn, and that can happen every 4 days! Yikes! Lionfish can exceed 18 inches in length, but most are less than 15 inches and they are able to consume prey that are more than half their own length. The largest recorded Lionfish was caught in the Florida Keys, measuring in at 19.5 inches. So what can you do? You can be the predator to these Lionfish! Lionfish are slow moving which can make it easy to spear or net. To help control this growing population both recreational and commercial divers are gearing up with their Lionfish kits to remove the Lionfish from the reefs and wrecks. It is very difficult to catch a Lionfish on a fishing pole so we have to rely on divers. Across the state, there are organizations and clubs that run Lionfish derbies and tournaments and every year FWC holds a Lionfish Removal Day, and this year it is May 20, 2017. Last year, FWC recorded 8,089 Lionfish removed across the state on just one weekend! But unfortunately we can’t reach them all. 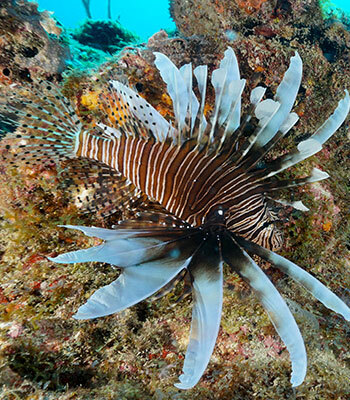 Lionfish will reside in depths too deep for divers to go. So people are trying to come up with ways to collect Lionfish at depth. Currently, Project Baseline has small aquatic submarines that can go out to remove Lionfish at depths, but that takes a lot of work. There are some scientists and organizations teaming up to try out a new design of deep-water Lionfish traps. Vone Research is building these traps and is set to deploy them this summer in the hope that we can wipe out Lionfish at deeper depths. Keep in mind if we can be the predator to Lionfish, though we might not be able to wipe out Lionfish completely, we can put huge pressure on this fish’s population. Currently, there are no minimum size limits, seasons or bag limits on these fish so it is not required to have a recreational fishing license to harvest them. But care should be taken when spearing a Lionfish because they have 18 venomous spines that can cause painful wounds. They are not aggressive, they just use these spines for defense, and divers are often seen using cutting sheers to remove the spines underwater before placing them in their catch bags. Using the right equipment to spear Lionfish is key. A pole spear with at least a three prong tip, puncture proof gloves, and a Lionfish containment bag (like a Zookeeper) are some of the best ways to go out and remove these fish from the ocean. Taking a class from a professional would also help you learn the tips and techniques on how to do this without causing any harm to yourself or to the reefs. Lionfish like to hide out in caves or holes in the reef, like moray eels do, so you want to make sure you know where to look and observe how they move in the water. The way you hold and angle your spear when spearing Lionfish requires a specific technique to get the right shot to help you to pin the Lionfish to a rock or sand. There is another plus to becoming a Lionfish predator - they are edible! Lionfish can be fileted and consumed raw or cooked. The spines are venomous but the flesh is not, and people have discovered that their white meat is quite delightful and non-fishy tasting. Often the meat is compared to that of the hogfish or flounder and some local Florida restaurants and supermarkets have started selling and serving Lionfish. REEF has a cookbook that has some amazing Lionfish recipes and we have this book for sale at our Force-E Scuba Centers. Please join us and become the predator to the Lionfish here in South Florida!